Product #10748 | SKU LPURK | 0.0 (no ratings yet) Thanks for your rating! The LockPort Universal - Rear Kit provides a locking HDMI mini to full HDMI plug that protects the fragile outputs on your 5D and 7D cameras from tough production abuse with a rock solid clamp and a smart mini to full-size HDMI adapter. 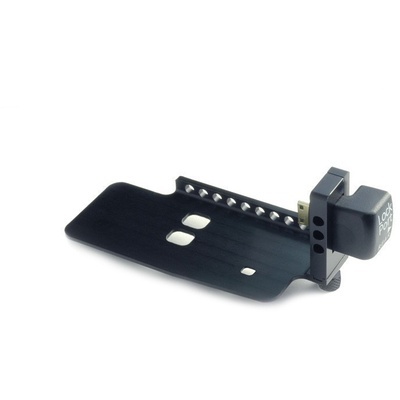 The LockPort universal adapter is designed to fit easily the popular RedRock Micro DSLR Baseplate using the original screws and soft adhesive pads. It safely secures a 90° REAR mini HDMI to full-size HDMI adapter, protecting forever the “expensive to repair” mini HDMI camera port. The adapter has gold plated contacts, the full-size female output allows you to use stronger standard HDMI cables. No loss of video signal anymore! The full-size HDMI output has stronger locking capabilities.